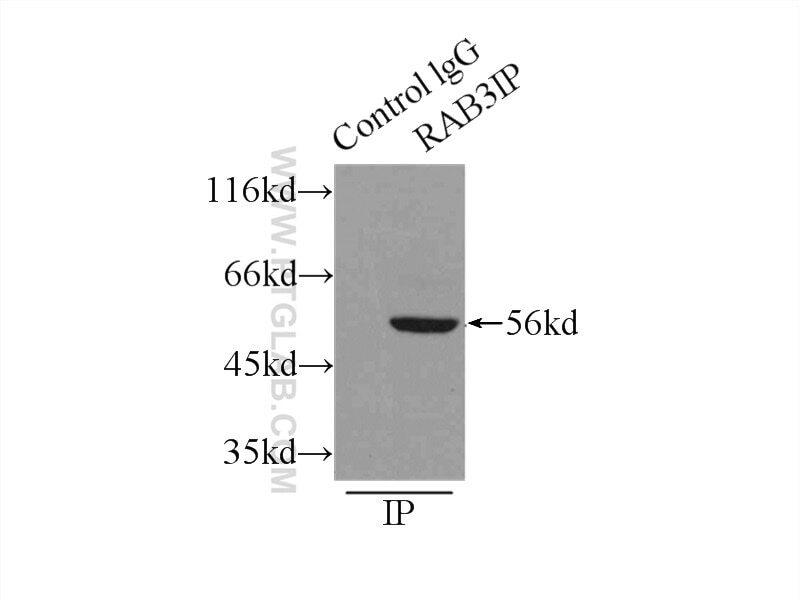 IP Result of anti-RAB3IP/Rabin8 (IP:12321-1-AP, 3ug; Detection:12321-1-AP 1:1000) with mouse lung tissue lysate 4500ug. 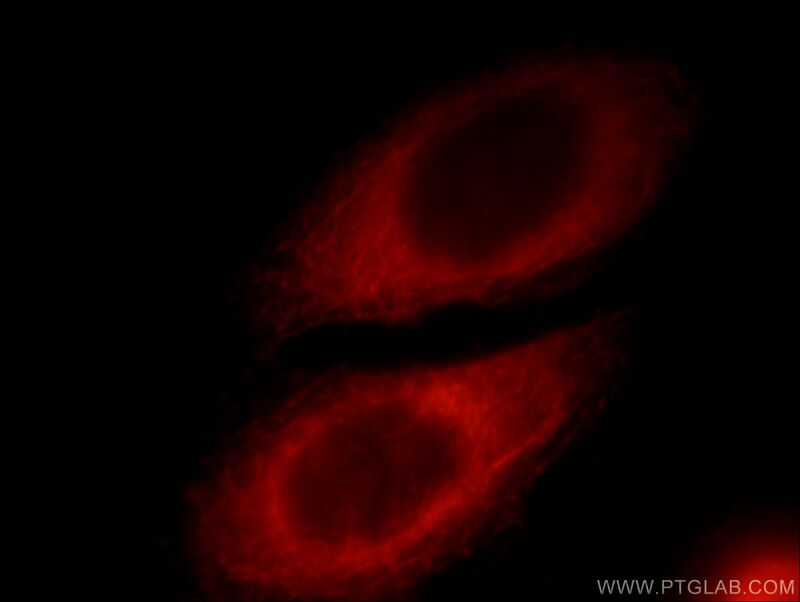 Immunofluorescent analysis of HepG2 cells, using RAB3IP/Rabin8 antibody 12321-1-AP at 1:25 dilution and Rhodamine-labeled goat anti-rabbit IgG (red). RAB3IP, also hnown as Rabin8, is a deduced 476-amino acid protein containing a central coiled-coil domain, a bipartite nuclear localization signal, and a C-terminal endoplasmic reticulum retention motif. Rabin8 has several sites for N-glycosylation and phosphorylation. Rabin8 plays important roles in various cellular processes, including ciliogenesis.The GEF activity of Rabin8 towards Rab8 is essential for ciliogenesis and cyst apical membrane transport,but not for exocytosis of discoidal/fusiform-shaped vesicles. Cytoplasmic control of Rab family small GTPases through BAG6. Guanine nucleotide exchange factors activate Rab8a for Toll-like receptor signalling. A molecular network for de novo generation of the apical surface and lumen. Rabin8 Protein Interacts with GTPase Rheb and Inhibits Phosphorylation of Ser235/Ser236 in Small Ribosomal Subunit Protein S6. RAB8B is required for activity and caveolar endocytosis of LRP6.